What strikes one most forcibly about this logo is the uncommon association between the name of a grape variety, Sangiovese, and friendship. The motto describing our initiative was, however, neither randomly chosen nor deliberately meant to excite curiosity because of its bizarre name. 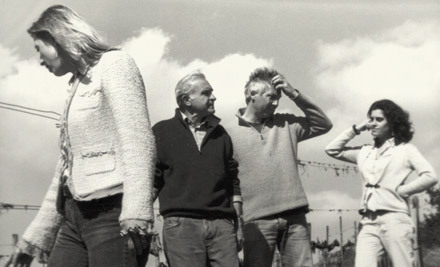 We are three vinedressers, or rather, winegrowers, who arrived in Montalcino from very different places and backgrounds. FRANCESCO LEANZA, the owner of PODERE SALICUTTI, of Sicilian origins, a chemist who moved to Rome and became a winegrower in Montalcino because fascinated by what he considers a unique territory. A reserved and introspective person, he is the first “organic” winegrower in Montalcino. STELLA DI CAMPALTO, the owner of AZIENDA AGRICOLA SAN GIUSEPPE, the youngest and most communicative of the group, comes from Rome but is cosmopolitan by temperament and experience. 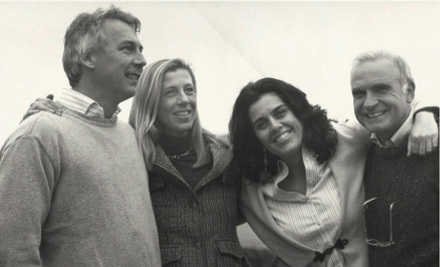 She “invented” San Giuseppe by converting an unused family estate into a winery. She travels a lot but cannot stay away for long from her vineyards. She is the first “biodynamic” winegrower in Montalcino. 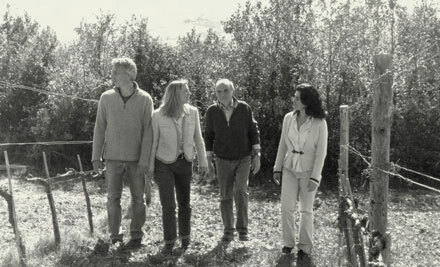 CAROLINE POBITZER and JAN HENDRIK ERBACH, the owners of PIAN DELL’ORINO, met in Montalcino where Caroline, from Alto Adige, had set up the firm and Jan Hendrik, from Germany, agronomist and enologist, worked as a consultant for her winery. They are now happily married and make a strong, passionate and determined couple. We met in Montalcino and soon became good friends. Friendship, just as any other true relationship, is born from affinity and sharing interests. 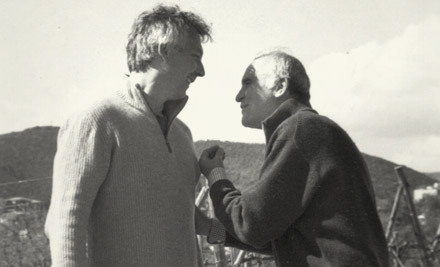 We have always shared the passion for Montalcino and its “bad-tempered” grape variety that we have grew fond of and, strange as it seems, humanized to the point that we see it as the mutual friend that keeps us together. We also share the sensibility to the environment protection issue that made us adopt organic and biodynamic farming methods. We instinctively felt the need to do something together to promote the varietal and territorial characteristics of the wines made in Montalcino from 100% Sangiovese, in particular, of the Brunello and Rosso di Montalcino wines. We also enjoyed the idea of encouraging the rigorous observance of production rules, in addition to the enhancement and promotion of the Sangiovese grape variety. That is what our initiative is about: we developed it with an open and friendly spirit and we hope that it will help increase the knowledge and appreciation of Sangiovese, our greatest passion. The initiative “Sangiovese Per Amico” is our way of giving expression to our beliefs and substance to our values. 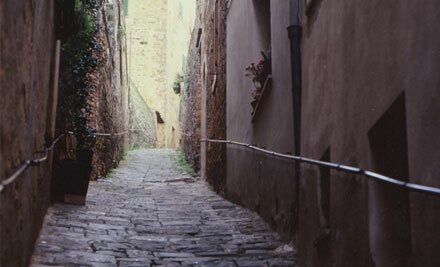 Montalcino is indissolubly tied to Brunello wine and Brunello of Montalcino wine is made from Sangiovese grapes. Sangiovese is a unique variety and represents today, and will even more in the future, an inestimable patrimony for the territory. 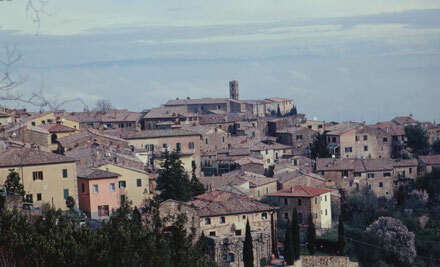 Montalcino is Sangiovese’s adopted homeland. The history of Brunello wine goes back to over 120 years ago and has achieved worldwide fame. Brunello has gained such a reputation thanks to several factors: first of all, Sangiovese’s easily recognizable high-quality which has produced, over the years, amazing wines in a micro and macroclimatic area. This is, no doubt, a gift from Nature. Brunello’s strength lies also in the clear production rules, governing winegrowing, winemaking practices and ageing techniques, which result from the experience of pioneers and reflect the everyday activity of modern winegrowers. Wine regulations guarantee also the highest quality standards for a wine that is a clear and unmistakable expression of the Montalcino territory and is above and beyond short-lived trends. Furthermore, the human interpretation of the natural factors plant/soil/climate creates a well-defined space for the realization of individual dreams. Last but not least, the sweet Tuscan hills, the gracefully cultivated olive trees, the well-tended vineyards, the towering cypresses and the farmers’ faces hardened by years of work in the fields. “Terroir” is not only a word here, but an everyday affair based on the mutual exchange between the land, Sangiovese, ideal climatic conditions and man’s cultural contribution. These are our basic values. In the nineties, we started harvesting, making and ageing wine from Sangiovese of Montalcino in our three wine firms, Podere Salicutti, Pian dell’Orino and Stella di Campalto. 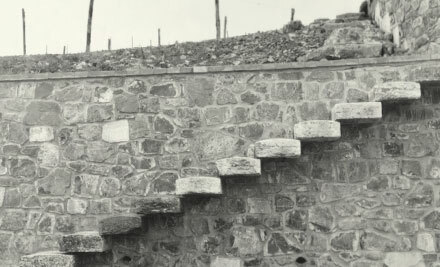 Three young wineries if compared with Montalcino’s century-old winegrowing history. Our vineyards are located south-east of Montalcino, along the road leading to Castelnuovo dell’Abate. We are linked by the passion for Brunello di Montalcino and the individual expression of our vineyards. We are linked by the joy and hard work of manual winegrowing, by the enthusiasm for a well-made wine, by the concern for the course and outcome of wine ageing. We are also linked by the difference in our vineyards, grapes and wine. Together we taste the wine, exchange our opinions and focus on new aspects to be prepared to face new challenges and make progress in every field. We treat wine with the utmost respect. Our territory and our grape variety require each and everyone’s sensitivity and creativity..
No work can be called art nor a landscape can become a garden without man’s dedication, intelligence and imagination. We believe that a great wine appellation is not simply the result of geographical or administrative boundaries nor of abstract and impersonal regulations. A territory and a grape variety, our territory and our grape variety require each and everyone’s sensitivity and creativity to produce something truly unique and unforgettable. This is our idea of enhancement. We believe that if our work were conducted only upon commercial and financial criteria, we would deprive ourselves and others of the pleasure of experiencing surprise and thrill and we would probably cause irreparable damage. To actively pursue our idea of enhancement, we tried to give content to the words “quality” and “authenticity” by defining the choices that guide our work in the vineyard and wine cellar. For Brunello and Rosso di Montalcino wines, we harvest only autochthonous Sangiovese grapes from our vineyards. The fermentation process is slow and spontaneous and achieved through indigenous enzymes. We do not use selected yeast nor commercial bacteria cultures. We make sure our wines are 100% genuine: we do not use flavourings, concentrated must, enzymes or other technological/industrial adjuvants. A databank on Sangiovese’s characteristics in our Montalcino vineyards. We ensure that our work is transparent by collaborating with an independent institute of analysis and research. Analytical activity has been carried out since harvest 2008, according to specific scientific methods for the creation of a databank on Sangiovese’s characteristics in our Montalcino vineyards aimed at guaranteeing the authenticity and provenance of our wines. Since harvest 2008, each winery has been running tests to define the anthocyanin and flavonoid profile of the grapes grown on the most representative vineyards and selected for the production of Brunello and Rosso di Montalcino wines. These profiles are compared with the analyses performed on the wine during the winemaking, ageing (every year) and bottling stages. This three-year analytical research will allow us, in the end, to define an anthocyanin and flavonoid profile of each vintage selection. As soon as the project is completed, we will have reliable data guaranteeing that our wines meet all the requirements of a 100% Sangiovese wine and come from a determinate vineyard. All the results of our research will be published and our wines will come with a technical sheet showing the composition and quality parameters. Our wineries are certified by an organic and biodynamic certifying body. Brunello of Montalcino wine is the mirror of the Sangiovese variety grown on gravel and clay-based soils in the microclimatic conditions typical of this region set to the north of the Amiata mountain where it freely expresses its “difficult character”. Producing wine in an area rich in charm and potential, which has not been fully exploited yet, requires a strong commitment. We have taken up the challenge of making, in this territory, from this grape variety, with the utmost respect for production regulations, uncommon wines having a soul and personality. The coloration of grapes and red wines is due to a family of pigments known as Anthocyanins (from a Greek word meaning “blue flower”) contained in the berry’s skin. The quantity of anthocyanins in fruit skin depends on environmental factors and viticultural practices, but it is mostly determined by genetic mechanisms. The main types of anthocyanins found in grapes are delphinidin, petunidin, malvidin, cyanidin, peonidin (always bonded to sugar molecules), either as monomers or in the acetated form (that is, combined with a molecule of organic acid such as acetic or coumaric acid). The percentage split between monomer and acetated form represents the so-called “anthocyanin profile”. It is a well-known fact that the differences between anthocyanin profiles are so clear that it is possible to subdivide all the known grape varieties in affinity classes; one of the main discriminant indexes is the presence of acetated anthocyanins and their relationship with monomer anthocyanins. The instrumental analysis (HPLC method), qualitative and quantitative, of these compounds is conducted according to an internationally-recognized method (Resolution 22/2003 of the Vine and Wine International Organization -OIV). This analysis, known since the eighties, has been used by laboratories in other European countries to verify the presence of foreign varietals in wine labeled as 100% Pinot Noir. This protocol provides for a check plan- in each winemaking stage- to determine the anthocyanin, flavonoid and analytical profile of the grapes grown on the wineries’ vineyards, having the characteristics required to reach a high poliphenolic concentration, and of the wines produced, to further understand the wine’s development over time and the parameters to be used in assessing the wine’s varietal purity. Berry samples will be collected prior to, during or after grape harvest, from two vineyards of each winery, selected according to the wine they will be used for, ROSSO or BRUNELLO DI MONTALCINO. Three samples per each vineyard in the three vintages 2008, 2009 and 2010 will be analyzed. The samples of wine from vineyards producing ROSSO DI MONTALCINO will be analyzed after racking off, after a year of barrel ageing and after six months of bottle ageing. The sampling and analysis will be repeated for the three vintages 2008, 2009, 2010. The samples of wine from vineyards producing BRUNELLO DI MONTALCINO will be analyzed after racking off, after 1, 2, 3 years of barrel ageing and after six months of bottle ageing. This sampling and analysis will be repeated for the three vintages 2008, 2009, 2010. The analysis of grapes will be completed with harvest 2010. 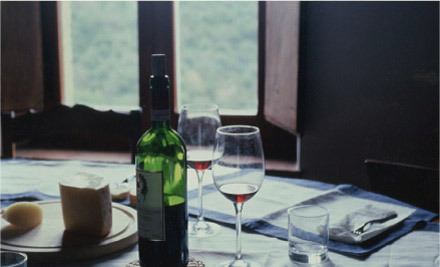 The analysis of Rosso di Montalcino wines will be completed in March 2012. 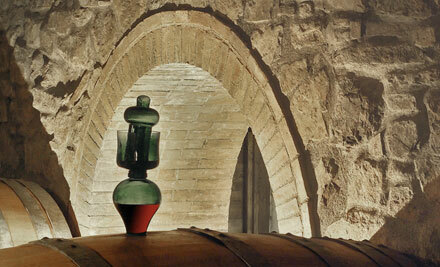 The analysis of Brunello di Montalcino wines will be completed in March 2014. Click here to download the document “Analytical results- Harvest 2008”.